I discovered these images and was instantly enchanted by the magic of this modern vintage home. I am a huge fan of bold colour and patterns. Wouldn’t it be wonderful to open the front door of your home on a damp drizzly day and be transported to the world of movies and glamour? 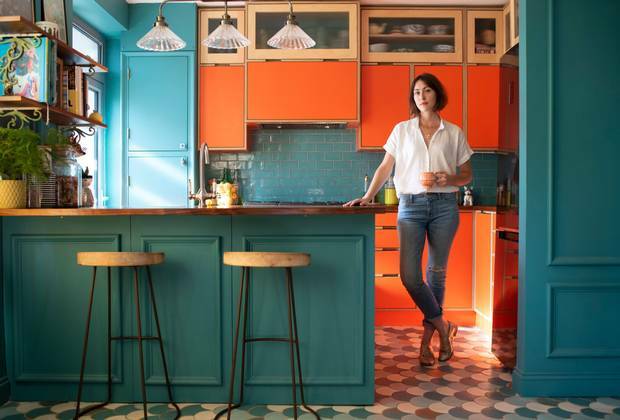 The London home of Irish creative Gillian Hyland is alive with colour and a unique retro-modern vibe. She cleverly uses pattern to blend with the strong colours, whether on the floor, the walls or the accessories. I love how she cleverly uses unusual shades to explode together in the most sublime way.